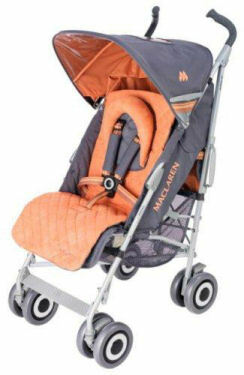 The U.S. Consumer Product Safety Commission has announced a recall of over one million stroller manufactured by Maclaren. The concern: The defective product may cause personal injury to the child riding in the stroller. At least 15 serious injuries have been reported, and 12 of these have been fingertip amputations. The recall affects all Maclaren strollers manufactured since 1999, including all single and double strollers. They popular baby strollers have been sold at Target, Babies “R” Us and other mass merchandisers. Parents should immediately stop using the strollers and obtain a free repair kit from the manufacturer. For additional information, contact Maclaren USA toll-free at (877) 688-2326 between 8 a.m. and 5 p.m. ET Monday through Friday or visit the firm’s Web site at www.maclaren.us/. Here is a link to the recall notice. You can also search for information on the Consumer Product Safety Commission (CPSC) website. If you or a loved one has been injured by a defective product, there are important steps you should take. First, obviously, seek appropriate medical treatment. Next, it is critical that you preserve the physical evidence–the product involved–without taking it apart or making any other changes. You should then seek assistance from an experienced product liability lawyer. For additional information, see our web page on Product Liability. The experienced lawyers at Breakstone, White & Gluck can help you answer any questions you have about injuries caused by defective and dangerous products. Please call us, toll free, for a free consultation: 800-379-1244.